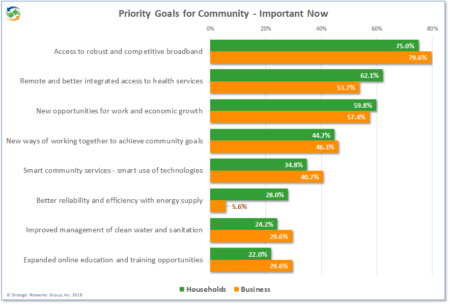 Broadband, Sustainable Development, and the Aspirational Community | Strategic Networks Group, Inc.
With limited budgets, all communities and regions are challenged in how to allocate scarce resources among various interests – especially when those interests appear to be competing. Community and investment priorities need to be understood so that local leaders can make the best decision for their constituents. Broadband and digital infrastructure investments are now part of this process. When the value of broadband and digital infrastructure is not clear, nor quantified in terms of community and economic development benefits, the consequence often is an under-investment. Broadband needs to be understood as an enabler, not as an end in itself. SNG’s research shows that the majority of businesses, organizations, and households do not understand the potential value of broadband and applications enabled by the internet can have. What has been missing and what is needed is a way to personalize the return on investments in digital connectivity to communities, businesses, and residents. SNG has developed an investment framework for broadband as an enabler of community and economic development goals. It is based on the United Nation’s Sustainable Development Goals (SDGs) adopted by 193 countries in the 70th UN General Assembly in 2015 for governments, businesses, civil society and the general public to work together to build a better future for everyone. SNG has adapted a subset of the SDGs that are applicable to industrialized countries in an increasingly digital economy. See how Custer County, Colorado, has prioritized sustainable development goals which can be found in the full report Custer County Broadband Impact and Market Assessment. How are American cities addressing broadband challenges? Successful cities continually strive to offer quality of life and economic opportunities to compete and attract people and businesses. Like clean water, good roads, and reliable electricity, high-speed internet (broadband) access is an essential service for local governments, households, businesses, and organizations. Cities that aspire to ensure affordable and ubiquitous broadband, along with smart city services, enhance quality of life and create an environment people will choose to live and work. 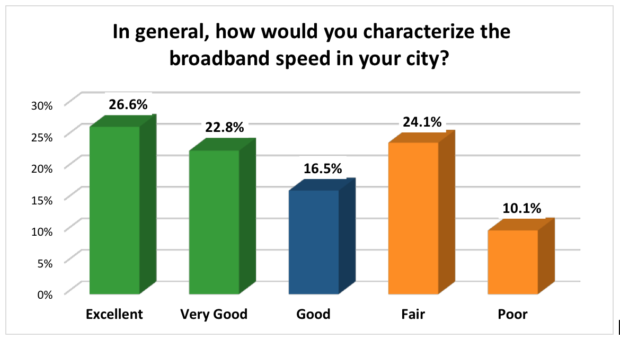 Though slightly more than a third (34.2%) characterize speeds available in their city as “fair” or “poor,” nearly half say their service is either “excellent” or “very good.” This indicates a sizable divide* between the haves and have nots in terms of cities with adequate broadband. Nearly two-thirds (64 percent) of cities do not have any of the mechanisms, organizations, or programs in place to help drive the economic opportunities broadband provides a community’s economy. 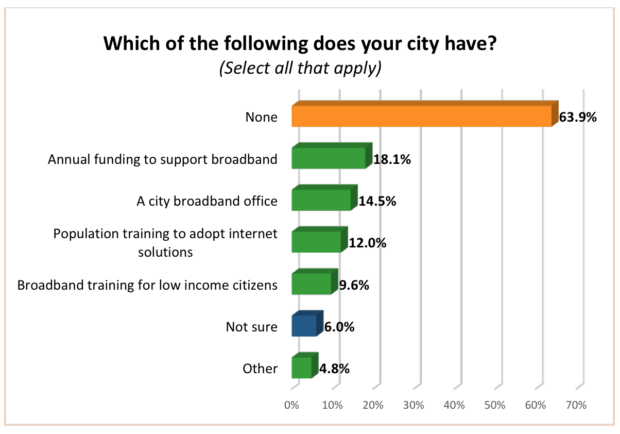 Only 14.5 percent have a city broadband office. 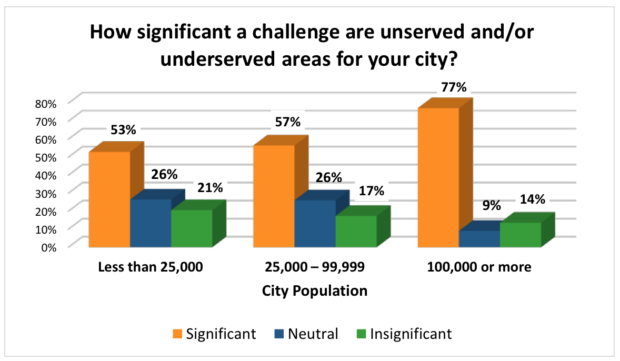 According to the feedback SNG received, cities with fewer than three providers were evenly split between having “excellent/very good” speeds and “fair/poor” speeds. For cities with three or more providers, there were twice as many reported “excellent/very good” speeds as “fair/poor” speeds.